JAPAN TODAY, March 17, 2017, PYEONGCHANG, South Korea —The Tokyo Organising Committee of the Olympic and Paralympic Games (Tokyo 2020) on Friday confirmed that the International Olympic Committee Executive Board has approved the Fukushima Azuma Baseball Stadium in Fukushima Prefecture as an additional venue for Baseball and Softball events at the 2020 Tokyo Olympic GamesTokyo 2020, together with the World Baseball Softball Confederation (WBSC), believes that the hosting of events in Fukushima will support recovery efforts in the overall Tohoku region, which was hit in the 2011 Great East Japan EarthquakeMatches played in the Tohoku region will be further evidence of Tokyo 2020’s commitment to bring sporting events to the recovering areas and will demonstrate the power of sport, the committee said. It was already decided that Miyagi Prefecture, similarly affected by the 2011 disaster, will host soccer matches during the competition’s preliminary rounds. In this way, the 2020 Games will serve as a spiritual and physical symbol of Japan’s recovery from a national tragedyTokyo 2020 President Yoshiro Mori said: “By hosting Olympic baseball and softball events, Fukushima will have a great platform to show the world the extent of its recovery in the 10 years since the disaster. It will also be a wonderful chance for us to show our gratitude towards those who assisted in the region’s reconstruction. And I’m sure the people of Fukushima are also looking forward very much to seeing Olympics events hosted there.WBSC President Riccardo Fraccari said: “WBSC congratulates Tokyo 2020 President Mori and IOC President Bach on this great step taken with Olympic baseball and softball as a vehicle to inspire hope and highlight the regeneration in Fukushima. It is a tremendous honour and a duty we take very seriously to be a part of something so meaningful – to serve the Olympic Movement and to use the power of sport to shape a better world. It is in this wonderful spirit that WBSC held the U-15 Baseball World Cup last year in Iwaki, Fukushima.Located in the green Azuma Sports Park, the Fukushima Azuma Baseball Stadium will be renovated for the 2020 Games, extending its legacy for future generations of baseball and softball athletes and fans in the region. A number of Nippon Professional Baseball games have been held at this stadium. 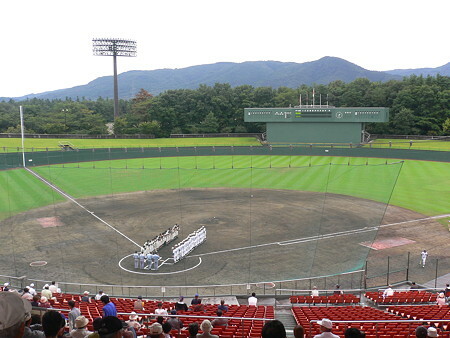 Tokyo 2020 and WBSC will work together with the aim of staging Olympic matches featuring the Japanese national baseball and softball teams at the venue in Fukushima. Along with the added stadium, the Yokohama Stadium in Kanagawa prefecture remains as the primary venue to host baseball and softball competitionsThe addition of the Fukushima Azuma Baseball Stadium brings the number of Tokyo 2020 Games venues to 40, including eight new permanent venues, 23 existing sites and nine temporary venues. Thirty-nine of these 40 venues will be used for competitions of the Olympic Games, and 20 of them will be used for the Paralympic Games.